Theoretically, asparagus season should be over, but I still see some in the market. Thankfully, there’s enough time for one last couscous salad with asparagus pesto before the last stalks disappear altogether from the produce aisles. I’ve been fiddling with this idea for the last month and it just keeps getting better. The concept started with samples of asparagus pesto handed out at New Seasons, a terrific local chain of natural food stores here in Portland. From the first bite, I was enchanted by this sauce, which is a little sweeter and more delicate than pesto made primarily with basil. It seemed a perfect match with the Israeli couscous that I had picked up on an excursion to Bob’s Red Mill in Oregon City. Israeli couscous, also known as pearl couscous, is much larger than the more familiar, fine-grained couscous and has a delightfully chewy texture. The first time I made this salad, I tossed fresh fava beans with the little balls of pasta and a dollop of pesto. That version was truly memorable. Later, though, when the fava season petered out, I switched to edamame and the salad was still wonderful. Along the way, I added Kalamata olives and arugula to play zesty counterpoint to the creamy pesto. Cherry tomatoes contributed zip and color. The ultimate salad is perfect for summer picnics and potlucks. My son, who never was a big fan of basil pesto, can’t get enough of it. I’ve tweaked the original pesto recipe a bit, of course, increasing the proportion of garlic, almonds and Pecorino cheese while reducing the olive oil to achieve the right consistency for easy mixing. Although the recipe now makes about 1 cup of sauce, you’ll only need about half that amount for the salad. Save the rest for crostini, pasta or maybe even an asparagus pizza. It should freeze well. In a pinch, you could use basil pesto but it wouldn’t be quite as good. Sometimes the best ideas come at the end of a season, when you’ve already eaten your fill of a precious ingredient in familiar dishes. Only then are you ready to take a risk on culinary experiments. Make the pesto by placing the asparagus, broken into pieces about 2 inches long, in the work bowl of a food processor with basil, garlic, almonds and cheese. Pulse the ingredients a couple of times to chop the mixture coarsely. Then, with the motor running, slowing drizzle oil through the feed tube of the processor and blend until ingredients come together into a smooth, fluid pesto. Season with salt and pepper to taste and set aside. Fill a 3-quart or larger saucepan about halfway with water, add a generous amount of salt and bring to a boil. Add edamame and cook according to instructions on the package. When edamame are tender, remove from saucepan with a slotted spoon or strainer and rinse in cold water to stop the cooking. Bring water in pan back to a boil, add couscous and cook for about 10 minutes, or until al dente. Drain couscous into a fine mesh colander and rinse with cold water. 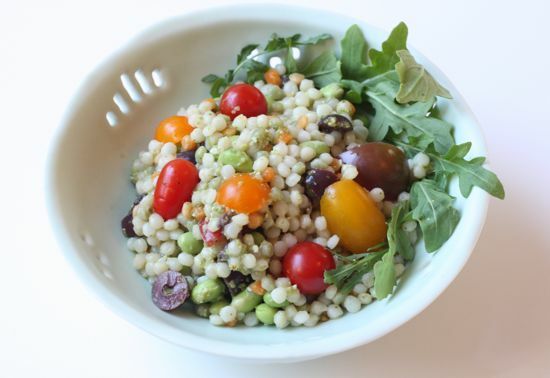 In a medium bowl, toss couscous, edamame, olives, tomatoes and arugula with about 1/2 cup of the asparagus pesto. Taste for seasoning and add more salt or pepper if needed. Serve cold or at room temperature. Aleta, you ate such a wonderful writer. I always feel as if I’m in the kitchen with you.